January 22, 2012 Marcus Mottley, Ph.D. Emotional freedom is one of the answers that you need in order to heal your hurt and to deal effectively with emotional pain. To achieve emotional freedom you must learn how to understand and protect your own inner sensitivity. You must discover the secrets of how to empower yourself from the inside out. You must also develop ways to understand why you feel the way you do. Even more importantly you must learn how to change your feelings to those that sustain and uplift you. Achieving emotional freedom involves learning how to face your inner fears, confront them and build unstoppable courage that leads to finally doing all the things that you have ever wanted to do and have never been able to follow through on. Other benefits of gaining emotional freedom involves developing the ability to be sensitive to and read people’s emotions. You begin to combat the many emotional vampires in your life who have been sapping you dry, draining your energy and diminishing your spirit. You learn to stop other people’s emotions from dragging yours along with them. One of the greatest benefits of emotional freedom is that you learn how to transform anger, jealousy, frustrations and disappointments into the positive energy of patience, hope, love and inner excitement. 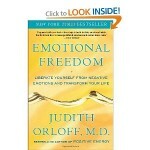 Judith Orloff has written a powerful guide that encapsulates all of the above. In her book Emotional Freedom, she shows you how to identify the most powerful negative emotions and how to transform them into hope, kindness, and courage. Emotional Freedom is a road map for those who are stressed out, discouraged, or overwhelmed as well as for those who are in a good emotional place but want to feel even better.